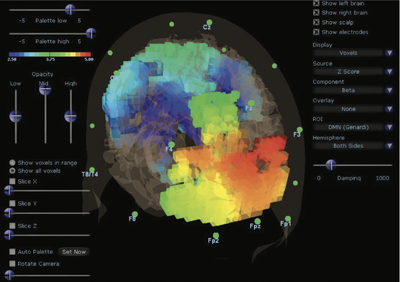 Saponara Brain & Spine Center is proud to introduce the most sophisticated, state-of-the-art, real-time imaging system available, the Brainmaster Freedom 24 QEEG with sLORETA 3D brain imaging. This amazing unit is able to reconstruct brain electrical activity in real time, and produce accurate 3D images of brain activation. 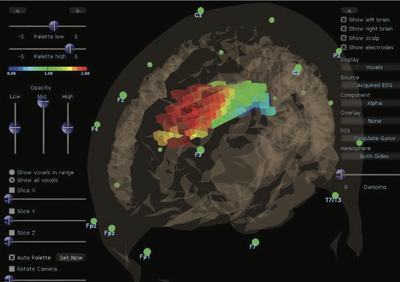 Specific results are shown demonstrating the ability of this technique to isolate brain functional regions including networks and hubs, as a function of instantaneous brain state. 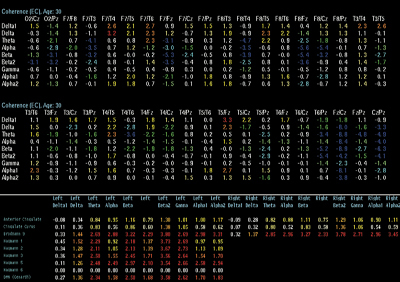 Genardi’s Default Mode Network shown withinreconstruction using a normative database. Z-Scores reflecting the instantaneous current-source density compared to a normative population within Regions of Interest (ROI) and Network Z-Scores.